This week is True Blood’s last episode of Season 6 and Brian Buckner, the new showrunner, and Deborah Ann Woll spoke to EW giving them some hints about what we can expect to see in this last episode. 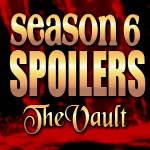 Brian Buckner says that this episode won’t be as bloody as last week’s Vamp Camp massacre. The first half of the episode focuses on Sookie (Anna Paquin) and “a less patient” Warlow (Rob Kazinky), who expects her to follow through on her promise to become his fairy-vampire bride. There’s a “significant time jump” in the second half of the episode, Buckner says, which will help move the action back to Bon Temps for next season so it won’t feel like separate vampire, fairy, and werewolf shows — which the actors are excited about. Bill (Stephen Moyer) will recognize the error of his ways. ”The question going forward is, can he be forgiven?” Buckner says. Of course, there won’t be a happy ending for everyone. Big picture, let’s not forget that we have vampires infected with Hep V and a continuing Tru Blood shortage and now that Jessica is out of Vamp Camp, will she have to answer to Andy (Chris Bauer) for killing three of his fairy daughters? I’m quite worried about Alex’s leaving the show…We’ve so much many wonderful actors in this show, but without Alex it will never be the same… Can anyone tell me if these rumors are true or not?